living room. Is he English? When my family and I traveled to Mexico City to visit our Huesca family in June 2003, I spotted a large frame on the wall of one of my paternal aunts. The frame contained a pictorial family tree of the Huesca family, lovingly made for her by one of my Huesca Sánchez cousins. Most of the photographs on the family tree were of my paternal grandparents, José Gil Alberto Cayetano and Catalina (Perrotin) Huesca, my great-grandmother and great-aunt, Maria (Amaro) Perrotin and Blanca Perrotin, and their 11 children, including my father, Gilbert Huesca, my aunt C., and their brothers and sisters. There were about five other small photographs in the frame that I did not recognize. These pictures were not placed on the family tree, because no one seemed to know who they were. At the time we looked at the photographs, neither my father nor my aunt were able to identify them. I immediately asked my aunt, or Tía C. for permission to borrow the frame and make copies of the photographs from behind the glass. She was happy to loan it to me, and I am eternally grateful to her. It took some time to find a copy and print shop near our hotel. Bundling the frame with sweaters, I made my way through the press of pedestrians and headed to the shop, taking care to not bump into anyone on the way. Those who have been in Mexico City know this is no easy task. The job took over an hour to complete, but it was worth the effort. Most of the copies turned out well, considering the photographs themselves were still under glass. This one, however, turned out a bit fuzzy, and it is hard to make out the name and location of the photographer on the bottom. I cannot be sure, but I wonder if it is a portrait of Charles Bennett, son of Timothy and Maria Dolores (Perrotin) Bennett, of Ruardean, Gloucestershire, England. If you can identify this handsome young man or have any thoughts on possible clues, let me know, and I will share the information in a later post. Linda, of course I have no idea whether the man's identity is what you are guessing, but I do have a suggestion. I had a mystery photo like that a while back–a man in uniform–and had no idea who he was. 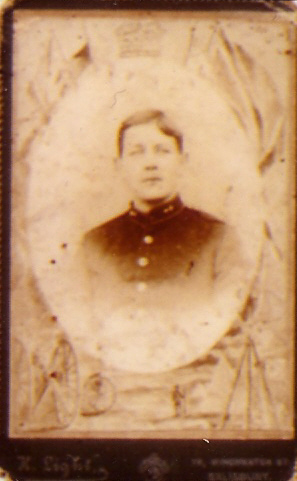 I posted the photograph on my blog, then visited each of the genealogy forums online, posted a query in their sub-category for military topics, complete with link back to my blog post, asking anyone who was well informed about military uniforms to view the picture and help me determine what type of uniform it might be. If the details on the uniform in your photograph are clear enough, perhaps you can try that same approach. It certainly was helpful to me in discovering information regarding my family's mystery photograph. Hi Linda. I'm looking at your blog with my parents. Bill and Trudy Bennett. My dad is Charles Bennentt's son. He thinks he has this picture at home ( they are visiting me in California), and he thinks it's his dad, Charles Bennett. He was a British soldier during the 1st World War. I am Diane Garner. Maiden Name Diane Bennett. Daughter of Bill and Trudy Bennett. Well your dear dad would most certainly recognize his own father! This was my thought, too. Do either of you know what he did or where he served during that war? Those would be interesting things to know. I guessed it was either you or Tammy, Diane! My Facebook cousin! Are you visiting your folks up in Michigan? What a coincidence. Just late this afternoon, I was talking to a colleague from Fort Huron, and I mentioned your dad. Were his ears burning? Much love to him and you, too! Pretty amazing how this all came together! Isn't it fascinating how the mystery of an English soldier all the way from Mexico City is decoded by some of the mystery mans own family? And all of it right here on your site decades after the photo was taken! This is so fun to watch unfold! You need to post again soon! Diane, what a fascinating story! Do you know if anyone in the family has any of his military records? I've been unable to find anything so far but will keep searching. He certainly went through a very tough time but must have been a real hero to the villagers of Ruardean – and of course to his family. Regards to you and yours.